"Bike" redirects here. For other uses, see Bike (disambiguation). The most popular bicycle model—and most popular vehicle of any kind in the world—is the Chinese Flying Pigeon, with about 500 million produced. A bicycle, also called a cycle or bike, is a human-powered or motor-powered, pedal-driven, single-track vehicle, having two wheels attached to a frame, one behind the other. A bicycle rider is called a cyclist, or bicyclist. Other words for bicycle include "bike", "pushbike", "pedal cycle", or "cycle". In Unicode, the code point for "bicycle" is 0x1F6B2. The entity &#x1F6B2; in HTML produces 🚲. The Svea Velocipede with vertical pedal arrangement and locking hubs was introduced in 1892 by the Swedish engineers Fredrik Ljungström and Birger Ljungström. It attracted attention at the World Fair and was produced in a few thousand units. Bikes can be used for entertainment and pleasure, such as in organised mass rides, artistic cycling and freestyle BMX. The bicycle has undergone continual adaptation and improvement since its inception. 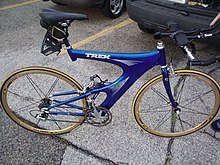 These innovations have continued with the advent of modern materials and computer-aided design, allowing for a proliferation of specialized bicycle types, improved bicycle safety, and riding comfort. Unicycles, tricycles and quadracycles are not strictly bicycles, as they have respectively one, three and four wheels, but are often referred to informally as "bikes" or "cycles". 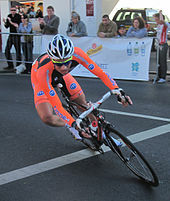 Short-wheelbase or tall bicycles, when braking, can generate enough stopping force at the front wheel to flip longitudinally. The act of purposefully using this force to lift the rear wheel and balance on the front without tipping over is a trick known as a stoppie, endo, or front wheelie. In addition, the carbon dioxide generated in the production and transportation of the food required by the bicyclist, per mile traveled, is less than 1/10 that generated by energy efficient motorcars. An alternative to chaindrive is to use a synchronous belt. These are toothed and work much the same as a chain—popular with commuters and long distance cyclists they require little maintenance. 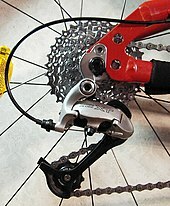 They can't be shifted across a cassette of sprockets, and are used either as single speed or with a hub gear. Bicycle suspension refers to the system or systems used to suspend the rider and all or part of the bicycle. This serves two purposes: to keep the wheels in continuous contact with the ground, improving control, and to isolate the rider and luggage from jarring due to rough surfaces, improving comfort. Basic mountain bicycles and hybrids usually have front suspension only, whilst more sophisticated ones also have rear suspension. Road bicycles tend to have no suspension. Bicycle helmets can reduce injury in the event of a collision or accident, and a suitable helmet is legally required of riders in many jurisdictions. Helmets may be classified as an accessory or as an item of clothing. Bike trainers are used to enable cyclists to cycle while the bike remains stationary. They are frequently used to warm up before races or indoors when riding conditions are unfavorable. Bicycles can also be fitted with a hitch to tow a trailer for carrying cargo, a child, or both. The International Organization for Standardization (ISO) has a special technical committee for cycles, TC149, that has the scope of "Standardization in the field of cycles, their components and accessories with particular reference to terminology, testing methods and requirements for performance and safety, and interchangeability". Some bicycle parts, particularly hub-based gearing systems, require considerable torque for dis-assembly and may thus need professional services. Self-service and assisted-service maintenance and repair may be available. Some cyclists choose self-service: they maintain their own bicycles, perhaps as part of their enjoyment of the hobby of cycling or simply for economic reasons. There exist several hundred assisted-service Community Bicycle Organizations worldwide. At a Community Bicycle Organization, laypeople bring in bicycles needing repair or maintenance; volunteers teach them how to do the required steps. Full service is available from bicycle mechanics at a local bike shop. In areas where it is available, some cyclists purchase roadside assistance from companies such as the Better World Club or the American Automobile Association. 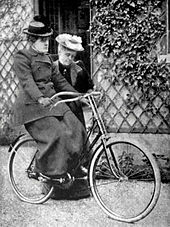 "Let go – but stand by"; Frances Willard learning to ride a bicycle. Wilbur and Orville Wright, a pair of businessmen, ran the Wright Cycle Company which designed, manufactured and sold their bicycles during the bike boom of the 1890s. Early bicycles were an example of conspicuous consumption, being adopted by the fashionable elites. In addition, by serving as a platform for accessories, which could ultimately cost more than the bicycle itself, it paved the way for the likes of the Barbie doll. In line with the European financial crisis, in Italy in 2011 the number of bicycle sales (1.75 million) just passed the number of new car sales. The proper Islamic bicycle for the Iranian women is a topic of heated discussion in both Sunni and Shia Islam. The global bicycle market is $61 billion in 2011. As of 2009[update] 130 million bicycles were sold every year globally and 66% of them were made in China. 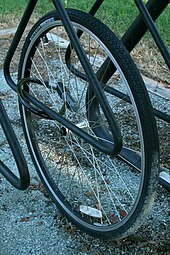 A bicycle wheel remains chained in a bike rack after the rest of the bicycle has been stolen at east campus of Duke University in Durham, North Carolina. The worlds longest bicycle was created by Santos and University of South Australia. It measures at 41.42 m (135 ft 10.7 in) long. ^ a b c d Koeppel, Dan (January–February 2007). "Flight of the Pigeon". Bicycling. Vol. 48 no. 1. Rodale. pp. 60–66. ISSN 0006-2073. Retrieved 2012-01-28. ^ a b "Bicycling; A way of life; Faster in town than going by car, bus, tube or on foot". The Economist. April 20, 2011. ^ a b "Bicycles produced in the world". Worldometers. Retrieved 2 January 2012. ^ a b Squatriglia, Chuck (23 May 2008). "Honda Sells Its 60 Millionth – Yes, Millionth – Super Cub". Wired. Retrieved 31 October 2010. ^ a b "That's 2.5 billion cc!". American Motorcyclist. Westerville, OH. May 2006. p. 24. ISSN 0277-9358. Retrieved 31 October 2010. ^ a b "Toyota ponders recall of world's best-selling car". Australian Broadcasting Corporation News Online. 18 February 2010. ^ a b Herlihy 2004, pp. 200–50. ^ a b c d Herlihy 2004, pp. 266–71. ^ a b c Herlihy 2004, p. 280. ^ "bicycle (n.)". Online Etymology Dictionary. Retrieved 10 February 2014. ^ "Transport and Map Symbols" (PDF). unicode.org. Retrieved 10 February 2014. ^ a b "Baron von Drais' Bicycle". Canada Science and Technology Museum. Retrieved 10 February 2014. ^ Herlihy 2004, p. 26. ^ Herlihy 2004, pp. 66–67. ^ "Is dangerous cycling a problem?". BBC News. 13 April 2011. Retrieved 11 February 2014. ^ Bulletin des lois de la République française (1873) 12th series, vol. 6, p. 648, patent no. 86,705: "Perfectionnements dans les roues de vélocipèdes" (Improvements in the wheels of bicycles), issued: 4 August 1869. ^ Norcliffe 2001, p. 50. ^ McGrory, David. A History of Coventry (Chichester: Phillimore, 2003), p. 221. ^ Norcliffe 2001, p. 47. ^ "Cycle market: Moving into the fast lane". The Independent. 26 February 2018. ^ Sheldon Brown. "One-Speed Bicycle Coaster Brakes". Archived from the original on 29 November 2010. Retrieved 2010-12-01. Coaster brakes were invented in the 1890s. ^ "On Your Bike..." BBC. 26 February 2018. ^ 24/7 Wall St. (26 January 2012). "The Best-Selling Cars of All Time". Fox Business. Archived from the original on 1 January 2016. ^ Various (9 December 2006). "Like falling off". New Scientist (2581): 93. Retrieved 27 January 2009. ^ Meijaard, J.P.; Papadopoulos, Jim M.; Ruina, Andy; Schwab, A.L. (2007). "Linearized dynamics equations for the balance and steer of a bicycle: a benchmark and review". Proceedings of the Royal Society A. 463 (2084): 1955–82. Bibcode:2007RSPSA.463.1955M. doi:10.1098/rspa.2007.1857. ^ Wilson, David Gordon; Jim Papadopoulos (2004). Bicycling Science (Third ed.). The MIT Press. pp. 270–72. ISBN 978-0-262-73154-6. ^ Fajans, Joel (July 1738). "Steering in bicycles and motorcycles" (PDF). American Journal of Physics. 68 (7): 654–59. Bibcode:2000AmJPh..68..654F. doi:10.1119/1.19504. Archived (PDF) from the original on 1 September 2006. Retrieved 2006-08-04. ^ Cossalter, Vittore (2006). Motorcycle Dynamics (Second ed.). Lulu. pp. 241–342. ISBN 978-1-4303-0861-4. ^ "Pedal power probe shows bicycles waste little energy". Johns Hopkins Gazette. August 30, 1999. ^ Whitt, Frank R.; David G. Wilson (1982). Bicycling Science (Second ed.). Massachusetts Institute of Technology. pp. 277–300. ISBN 978-0-262-23111-4. ^ "AeroVelo Eta: bullet-shaped bike sets new human-powered speed record". International Business Times. Sep 21, 2016. Retrieved 2016-11-29. ^ "How Much Do Bicycles Pollute? Looking at the Carbon Dioxide Produced by Bicycles". Kenkifer.com. 1999-11-20. Retrieved 2011-10-24. ^ "History Loudly Tells Why The Recumbent Bike Is Popular Today". Recumbent-bikes-truth-for-you.com. 1934-04-01. Retrieved 2011-10-24. ^ Lakkad; Patel (June 1981). "Mechanical properties of bamboo, a natural composite". Fibre Science and Technology. 14 (4): 319–22. doi:10.1016/0015-0568(81)90023-3. ^ a b Jen Lukenbill. "About My Planet: Bamboo Bikes". Archived from the original on 25 October 2012. Retrieved 14 January 2013. ^ Teo Kermeliotis (May 31, 2012). 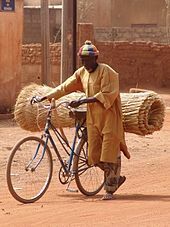 "Made in Africa: Bamboo bikes put Zambian business on right track". CNN. ^ Bamboo bicycles made in Zambia (TV news). Tokyo: NHK World News in English. 14 Jan 2013. Archived from the original on 2013-01-15. ^ Patterson, J.M. ; Jaggars, M.M. ; Boyer, M.I. (2003). "Ulnar and median nerve palsy in long-distance cyclists. A prospective study". The American Journal of Sports Medicine. 31 (4): 585–89. doi:10.1177/03635465030310041801. PMID 12860549. ^ Wade Wallace (1 October 2013). "Disc Brakes and Road Bikes: What does the Future Hold?". cyclingtips.com.au. Retrieved 24 February 2014. ^ John Allan. "Disc Brakes". sheldonbrown.com. Retrieved 24 February 2014. ^ Brown, Sheldon. "Fixed Gear Conversions: Braking". Archived from the original on 9 February 2009. Retrieved 2009-02-11. ^ a b Bluejay, Michael. "Safety Accessories". Bicycle Accessories. BicycleUniverse.info. Archived from the original on 8 October 2006. Retrieved 2006-09-13. ^ "The Essentials of Bike Clothing". About Bicycling. About.com. Archived from the original on 26 August 2006. Retrieved 2006-09-13. ^ "Bicycle Advisor". bicycleadvisor.com. Retrieved 16 December 2015. ^ "Community Bicycle Organizations". Bike Collective Network wiki. Retrieved 15 January 2013. ^ "Sheldon Brown: Flat tires". Archived from the original on 13 May 2008. Retrieved 2008-05-29. 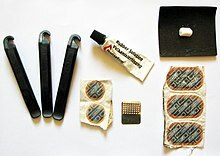 ^ "BikeWebSite: Bicycle Glossary – Patch kit". Archived from the original on 13 May 2008. Retrieved 2008-06-20. ^ Winters, M; Brauer, M; Setton, EM; Teschke, K (2010). "Built environment influences on healthy transportation choices: bicycling versus driving". J Urban Health. 87 (6): 969–93. doi:10.1007/s11524-010-9509-6. PMC 3005092. PMID 21174189. ^ Shaheen, Susan; Guzman, Stacey; Zhang, Hua (2010). "Bikesharing in Europe, the Americas, and Asia". Transportation Research Record. 2143: 159–67. doi:10.3141/2143-20. ^ Shaheen, Stacey; Stacey Guzman (2011). "Worldwide Bikesharing". Access Magazine. Archived from the original on 2012-03-26. ^ Shaheen, Susan; Zhang, Hua; Martin, Elliot; Guzman, Stacey (2011). 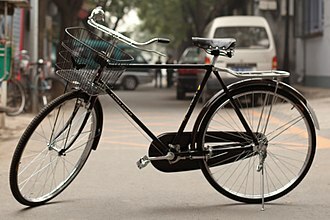 "China's Hangzhou Public Bicycle". Transportation Research Record. 2247: 33–41. doi:10.3141/2247-05. ^ Joel Broekaert & Reinier Kist (12 February 2010). "So many bikes, so little space". NRC Handelsblad. Retrieved 2010-02-13. ^ Damien Newton (October 16, 2008). "Metro Making Room for Bikes on Their Trains". LA.StreetsBlog.Org. Retrieved 2010-02-12. ^ Bernstein, Andrea, "Techies on the cutting edge... of bike commuting", Marketplace, February 22, 2012. "Bernstein reports from the Transportation Nation project at WNYC". Retrieved 2012-02-22. ^ "In Almost Every European Country, Bikes Are Outselling New Cars". NPR. 24 October 2013. ^ "Bicycle: The Unnoticed Potential". BicyclePotential.org. 2009. Archived from the original on 25 June 2011. Retrieved 2011-07-09. ^ Niklas Sieber (1998). "Appropriate Transportation and Rural Development in Makete District, Tanzania" (PDF). Journal of Transport Geography. 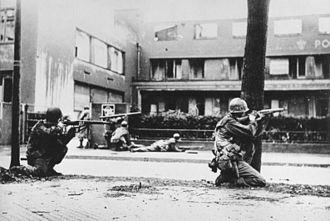 6 (1): 69–73. doi:10.1016/S0966-6923(97)00040-9. Retrieved 2011-07-09. ^ "Project Tsunami Report Confirms The Power of Bicycle" (PDF). World Bicycle Relief. Archived from the original (PDF) on 2010-12-26. Retrieved 2011-07-09. ^ a b c Willard, Frances Elizabeth (1895). A Wheel Within a Wheel: How I Learned to Ride the Bicycle, with Some Reflections by the Way. Woman's Temperance Publishing Association. pp. 53, 56. ^ Roberts, Jacob (2017). "Women's work". Distillations. 3 (1): 6–11. Retrieved 22 March 2018. ^ Husted Harper, Ida (1898). The life and work of Susan B. Anthony: including public addresses, her own letters and many from her contemporaries during fifty years. A story of the evolution of the status of woman, Volume 2. 2. The Bowen-Merrill Company. ^ "Wilbur Wright Working in the Bicycle Shop". World Digital Library. 1897. Retrieved 2013-07-22. ^ a b c d Norcliffe 2001, p. 23. ^ a b Norcliffe 2001, p. 106. ^ a b c d Norcliffe 2001, p. 108. ^ Norcliffe 2001, pp. 142–47. ^ Norcliffe 2001, p. 145. ^ Babaian, Sharon. The Most Benevolent Machine: A Historical Assessment of Cycles in Canada (Ottawa: National Museum of Science and Technology, 1998), p. 97. ^ Norcliffe 2001, p. 8. ^ Norcliffe 2001, p. 12. ^ Norcliffe 2001, p. 14. ^ Norcliffe 2001, pp. 147–48. ^ Norcliffe 2001, pp. 187–88. ^ Norcliffe 2001, p. 208. ^ Norcliffe 2001, pp. 243–45. ^ Norcliffe 2001, p. 121. ^ a b Norcliffe 2001, p. 123. ^ Norcliffe 2001, p. 212. ^ Norcliffe 2001, p. 214. ^ a b Norcliffe 2001, p. 131. ^ Norcliffe 2001, p. 30. ^ a b Norcliffe 2001, p. 125. ^ Norcliffe 2001, pp. 125–26. ^ Norcliffe 2001, p. 238. ^ Norcliffe 2001, p. 128. ^ Norcliffe 2001, pp. 214–15. ^ "The Wrights' bicycle shop". 2007. Archived from the original on 25 January 2007. Retrieved 2007-02-05. ^ Francois Bougo (May 26, 2010). "Beijing looks to revitalise bicycle culture". Agence France-Presse. ^ "Italian bicycle sales 'surpass those of cars'". BBC News. October 2, 2012. ^ Illich, I. (1974). Energy and equity. New York, Harper & Row. ^ "Peddling religion: Why secular academics fret about an "Islamic bicycle"". The Economist. Sep 15, 2012. ^ Michael Slackman (Sep 9, 2007). "Molding the Ideal Islamic Citizen". The New York Times. ^ Farzaneh Milani (Jun 28, 2007). "'Islamic bicycle' can't slow Iranian women". USA Today. ^ "High Growth and Big Margins in the $61 Billion Bicycle Industry". Seeking Alpha. Retrieved 2011-10-24. ^ "The Business of Bicycles | Manufacturing | Opportunities". DARE. 2009-06-01. Archived from the original on 2011-11-10. Retrieved 2011-10-24. ^ a b "2014 European Bicycle Industry & Market Profile". Confederation of the European Bicycle Industry. 2015. ^ Van Lierop, Dea; Grimsrud, Michael; El-Geneidy, Ahmed (2014). "Breaking into Bicycle Theft: Insights from Montreal, Canada". International Journal of Sustainable Transportation: 490–501. ^ "About Bicycle Theft". bicyclelaw.com. Retrieved 12 February 2014. ^ van Lierop Grimsrud El-Geneidy (2015). "Breaking into bicycle theft: Insights from Montreal, Canada" (PDF). International Journal of Sustainable Transportation. Retrieved September 30, 2015. ^ "Bike serial numbers". Retrieved 2017-08-02. Okay, fine, so maybe there are a few bikes without serial numbers, but this is rare and typical only on hand made bikes or really old bicycles. ^ "Longest bicycle". Guinness World Records. Retrieved 2016-12-14. Herlihy, David V. (2004). Bicycle: The History. Yale University Press. ISBN 978-0-300-12047-9. Norcliffe, Glen (2001). The Ride to Modernity: The Bicycle in Canada, 1869–1900. Toronto: University of Toronto Press. ISBN 978-0-8020-8205-3. Velocipede is a human-powered land vehicle with one or more wheels. The most common type of today is the bicycle. It is ultimately derived from the Latin velox, veloc- swift + pes, among the early velocipedes there were designs with one, three and even five wheels. 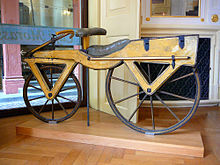 Some two-wheeled designs had pedals mounted on the front wheel, while three- and four-wheeled designs sometimes used treadles, the earliest usable and much-copied velocipede was created by the German Karl Drais and called a Laufmaschine, which he first rode on June 12,1817. He obtained a patent in January 1818 and it was made entirely of wood and metal and despite the condition of the roads at the time was sometimes ridden for long distances. The Michaux company was the first to mass-produce the velocipede, from 1857 to 1871 and that French design was sometimes called the boneshaker, since it was made entirely of wood, later with metal tires. That in combination with the roads of the day made for an extremely uncomfortable ride. These velocipedes became a fad, and indoor riding academies, similar to roller rinks, during the 1870s advances in metallurgy led to the development of the first all-metal velocipedes. The pedals were attached directly to the front wheel, which became larger and larger as makers realised that the larger the wheel. Solid rubber tires and the spokes of the large front wheel provided a much smoother ride than its predecessor. This type of velocipede was the first one to be called a bicycle and they enjoyed a great popularity among young men in the 1880s who could afford them. While young men were risking their necks on the wheels and dignified gentlemen such as doctors. Many innovations for tricycles eventually found their way into the automobile, such as rack and pinion steering, the differential, and band brakes, the forerunners to drum brakes. Boneshaker is a name used from about 1869 up to the present time to refer to the first type of bicycle with pedals. Boneshaker refers to the extremely uncomfortable ride, which was caused by the stiff wrought-iron frame and it fell out of favor after the summer of 1869, and was replaced in 1870 with the type of bicycle called ordinary, high-wheel, or penny-farthing. A vehicle is a mobile machine that transports people or cargo. Typical vehicles include wagons, motor vehicles, railed vehicles, Land vehicles are classified broadly by what is used to apply steering and drive forces against the ground, tracked, railed or skied. ISO 3833-1977 is the standard, used in legislation, for road vehicles types, terms. Boats were used between 4000 BC-3000 BC in Sumer, ancient Egypt and in the Indian Ocean, there is evidence of camel pulled wheeled vehicles about 3000–4000 BC. Wheeled vehicles pulled by men and animals ran in grooves in limestone, in 200 CE, Ma Jun built a south-pointing chariot, a vehicle with an early form of guidance system. Railways began reappearing in Europe after the Dark Ages, the earliest known record of a railway in Europe from this period is a stained-glass window in the Minster of Freiburg im Breisgau dating from around 1350. 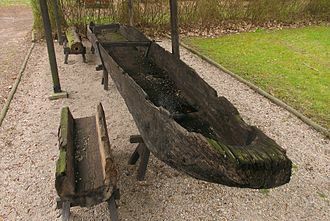 In 1515, Cardinal Matthäus Lang wrote a description of the Reisszug, the line originally used wooden rails and a hemp haulage rope and was operated by human or animal power, through a treadwheel. 1769 Nicolas-Joseph Cugnot is often credited with building the first self-propelled mechanical vehicle or automobile in 1769. In Russia, in the 1780s, Ivan Kulibin developed a human-pedalled, three-wheeled carriage with modern features such as a flywheel, gear box and bearings, however and it was introduced by Drais to the public in Mannheim in summer 1817. 1903 Wright brothers flew the first controlled, powered aircraft 1907 First helicopters Gyroplane no.1, there are over 1 billion bicycles in use worldwide. In 2002 there were an estimated 590 million cars and 205 million motorcycles in service in the world, at least 500 million Chinese Flying Pigeon bicycles have been made, more than an other single model of vehicle. The most-produced model of vehicle is the Honda Super Cub motorcycle. 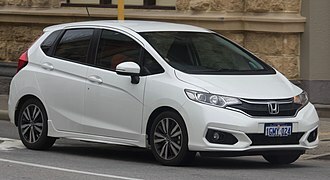 The most-produced car model is the Toyota Corolla, with at least 35 million made by 2010, by far, most vehicles use wheels which employ the principle of rolling to enable displacement with very little rolling friction. Cycling, called bicycling or biking, is the use of bicycles for transport, exercise or sport. Persons engaged in cycling are referred to as cyclists, bikers, or less commonly, apart from two-wheeled bicycles, cycling includes the riding of unicycles, quadracycles and similar human-powered vehicles. Bicycles were introduced in the 19th century and now approximately one billion worldwide. They are the means of transportation in many parts of the world. 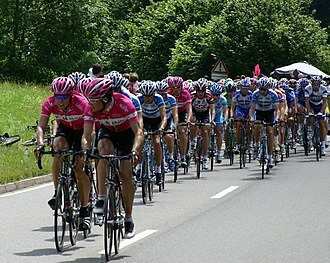 Cycling is widely regarded as an effective and efficient mode of transportation optimal for short to moderate distances. Cycling offers a reduced consumption of fuels, less air or noise pollution. These lead to financial cost to the user as well as to society at large. By fitting bicycle racks on the front of buses, transit agencies can significantly increase the areas they can serve, in many countries, the most commonly used vehicle for road transport is a utility bicycle. These have frames with relaxed geometry, protecting the rider from shocks of the road, utility bicycles tend to be equipped with accessories such as mudguards, pannier racks and lights, which extends their usefulness on a daily basis. As the bicycle is so effective as a means of various companies have developed methods of carrying anything from the weekly shop to children on bicycles. 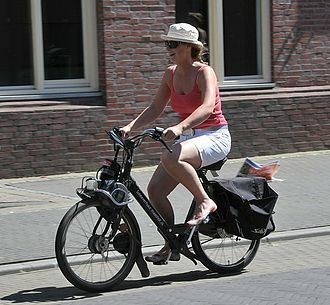 Certain countries rely heavily on bicycles and their culture has developed around the bicycle as a form of transport. In Europe and the Netherlands have the most bicycles per capita, road bikes tend to have a more upright shape and a shorter wheelbase, which make the bike more mobile but harder to ride slowly. The design, coupled with low or dropped handlebars, requires the rider to bend forward more, making use of stronger muscles, the price of a new bicycle can range from US$50 to more than US$20,000, depending on quality and weight. However, UCI regulations stipulate a legal race bike cannot weigh less than 6.8 kg, being measured for a bike and taking it for a test ride are recommended before buying. The drivetrain components of the bike should be considered, a middle grade dérailleur is sufficient for a beginner, although many utility bikes are equipped with hub gears. The interdisciplinary field of materials science, commonly termed materials science and engineering, involves the discovery and design of new materials, with an emphasis on solids. Materials science still incorporates elements of physics and engineering, as such, the field was long considered by academic institutions as a sub-field of these related fields. Materials science is a syncretic discipline hybridizing metallurgy, solid-state physics and it is the first example of a new academic discipline emerging by fusion rather than fission. Many of the most pressing scientific problems humans currently face are due to the limits of the materials that are available, breakthroughs in materials science are likely to affect the future of technology significantly. 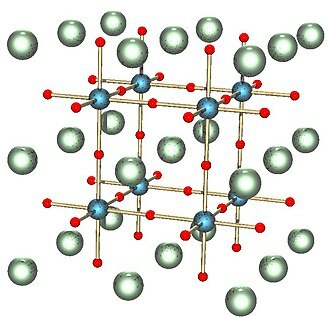 Materials scientists emphasize understanding how the history of a material influences its structure, the understanding of processing-structure-properties relationships is called the § materials paradigm. This paradigm is used to advance understanding in a variety of areas, including nanotechnology, biomaterials. Such investigations are key to understanding, for example, the causes of various accidents and incidents. The material of choice of a given era is often a defining point, phrases such as Stone Age, Bronze Age, Iron Age, and Steel Age are great examples. Originally deriving from the manufacture of ceramics and its putative derivative metallurgy, materials science is one of the oldest forms of engineering, modern materials science evolved directly from metallurgy, which itself evolved from mining and ceramics and the use of fire. Materials science has driven, and been driven by, the development of technologies such as rubbers, semiconductors. Before the 1960s, many materials science departments were named metallurgy departments, reflecting the 19th, a material is defined as a substance that is intended to be used for certain applications. There are a myriad of materials around us—they can be found in anything from buildings to spacecraft, Materials can generally be divided into two classes and non-crystalline. Wire wheels, wire-spoked wheels, tension-spoked wheels, or suspension wheels are wheels whose rims connect to their hubs by wire spokes. Although these wires are generally stiffer than a wire rope, they function mechanically the same as tensioned flexible wires. The term suspension wheel should not be confused with vehicle suspension, wire wheels are used on most bicycles and are still used on many motorcycles. They were invented by aeronautical engineer George Cayley in 1808, although Cayley first proposed wire wheels, he did not apply for a patent. 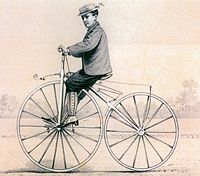 The first patent for wire wheels was issued to Theodore Jones of London, eugène Meyer of Paris, France was the first person to receive, in 1869, a patent for wire wheels on bicycles. Bicycle wheels were not strong enough for cars until the development of tangentially spoked wheels and they rapidly became well established in the bicycle and motor tricycle world but were not common on cars until around 1907. This was encouraged by the Rudge-Whitworth patented detachable and interchangeable wheels designed by John Pugh and these wheels owed their resistance to braking and accelerative stresses to their two inner rows of tangential spokes. An outer row of radial spokes gave lateral strength against cornering strains and these wheels were deeply dished so that steering pivot pins might lie as near as possible to the center-line of the tires. Their second feature was that they were easily detachable being mounted on splined false hubs, a process of assembling wire wheels is described as wheelbuilding. From the earliest days automobiles used either wire wheels or heavy wooden or pressed steel spoked artillery type, the development of the quick detachable hubs of either Rudge-Whitworth or Riley design did much to popularise wire wheels and incidentally led to the fitting of spare wheels. After their wooden spoked artillery wheels proved inadequate many US manufacturers paid John Pugh of Rudge-Whitworth royalties to manufacture wire wheels using his patents, some jurisdictions, including West Germany, prohibited eared hubcaps. Some manufacturers preferred to hold the wheel on the hub by capping with a single conventional unwinged nut requiring a special large spanner. The bicycle pedal is the part of a bicycle that the rider pushes with their foot to propel the bicycle. It provides the connection between the foot or shoe and the crank allowing the leg to turn the bottom bracket spindle. Pedals usually consist of a spindle that threads into the end of the crank and a body, on which the foot rests or is attached, pedals were initially attached to cranks connecting directly to the driven wheel. The safety bicycle, as it is today, came into being when the pedals were attached to a crank driving a sprocket that transmitted power to the driven wheel by means of a roller chain. Just as bicycles come in varieties, there are different types of pedals to support different types of cycling. Traditionally, platform pedals were pedals with a large flat area for the foot to rest on. 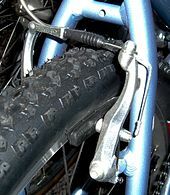 One form of the platform pedal had a flat top area and flat bottom for use with toe clips. They were designed for comfort when using shoes with less than rigid soles. They typically had a smaller cutaway underside giving greater cornering clearance and they were often marketed as being more aerodynamic than conventional quill pedals. Attaching the shoes to the pedals gives the more control over the pedal movements. In mountain biking and BMX, platform pedals typically refer to any flat pedal without a cage, BMX riders typically use plastic pedals made of nylon, polycarbonate, or carbon reinforced plastic, although aluminum alloy, and magnesium are not uncommon pedal body materials. Mountain bikers tend to use aluminum or magnesium because of the use of metal studs to offer grip while the pedals are wet, muddy. BMXers tend to prefer platforms to cage pedals because they offer more support, cage pedals are more popular in the low end mountain bike range. In general, cage pedals are uncommon in all types of biking, platform pedals are available in a wide variety of types and prices, ranging from disposable plastic units used for test rides on new bicycles to high-end downhill models. Budget models may be made of steel or aluminum and incorporate reflectors for safer riding on streets at night, less expensive platform pedals are generally considered disposable and cannot be rebuilt when worn out. A motorized bicycle is a bicycle with an attached motor and transmission used either to power the vehicle unassisted, or to assist with pedalling. Since it always retains both pedals and a discrete connected drive for rider-powered propulsion, the bicycle is in technical terms a true bicycle. However, for purposes of licensing and registration requirements, the type may be legally defined as a motor vehicle, moped. Powered by a variety of types and designs, the motorized bicycle formed the prototype for what would become the motorcycle. 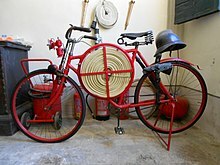 Motorized bicycles have utilized all variety of engines, from internal-combustion two-stroke and four-stroke gasoline engines to electric, most motorized bicycles are based or derived from standard general-purpose bicycle frame designs and technologies, although exceptions abound. In addition, modifications to a bicycle frame to support motorization may be extensive. In a day when gasoline engine and transmission designs were in their infancy, and power-to-weight ratios were low, as time went on, pedal propulsion was increasingly replaced by constant use of a two or four-stroke gasoline engine. In countries where automobiles and/or fuels are prohibitively expensive, the bicycle has enjoyed continued popularity as a primary mode of transportation. The design of the bicycle or motorbike varies widely according to intended use. Some motorized bicycles are powerful enough to be self-propelled, without use of the pedals, the alternate design philosophy to the moped is the so-called motor-assist or pedal-assist bicycle. These machines utilize the pedals as the dominant form of propulsion, the two-wheeled pedal powered bicycle was first conceived in Paris in the 1860s. 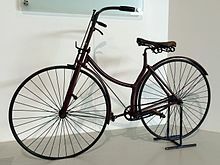 By 1888 John Dunlops pneumatic tire and the drive made possible the safety bicycle. The origins of the bicycle or motorbike can be traced back to the latter part of the 19th century when experimenters began attaching steam engines to stock tricycles and quadracycles. The first true motorized bicycle is considered to be the French Michaux-Perreaux steam velocipede of 1868. The Michaux-Perreaux was followed by the American Roper steam velocipede of 1869, built by Sylvester H.
A courier is a person who delivers messages and mail. Courier services operate on all scales, from within specific towns or cities, large courier companies include DHL, OCS, FedEx, EMS International, TNT, UPS, and Aramex. These offer services worldwide, typically via a hub and spoke model, in ancient history, messages were hand-delivered using a variety of methods, including runners, homing pigeons and riders on horseback. Before the introduction of mechanized courier services, foot messengers physically ran miles to their destinations, xenophon attributed the first use of couriers to the Persian prince Cyrus the Younger. Famously, the Ancient Greek courier Pheidippides is said to have run 26 miles from Marathon to Athens to bring the news of the Greek victory over the Persians in 490 BCE, the long-distance race known as a marathon is named for this run. Starting at the time of Augustus, the ancient Greeks and Romans made use of a class of horse and chariot-mounted couriers called anabasii to quickly bring messages, the word anabasii comes from the Greek αναβασις. They were contemporary with the Greek hemeredromi, who carried their messages by foot, in Roman Britain, Rufinus made use of anabasii, as documented in Saint Jeromes memoirs, Idcircone Cereales et Anabasii tui per diversas provincias cucurrerunt, ut laudes meas legerent. In the Middle Ages, royal courts maintained their own messengers who were little more than common labourers. In cities, there are often bicycle couriers or motorcycle couriers but for consignments requiring delivery over greater distance networks, many companies who operate under a Just-In-Time or JIT inventory method often use on-board couriers. On-board couriers are individuals who can travel at a moments notice anywhere in the world, International courier services in China include TNT, EMS International, DHL, FedEx and UPS. These companies provide nominal worldwide service for both inbound and outbound shipments, connecting China to countries such as the USA, United Kingdom, and New Zealand. Of the international services, the Dutch company TNT is considered to have the most capable local fluency and efficacy for third-. Mode of transport is a term used to distinguish substantially different ways to perform. The most dominant modes of transport are air and land transport, other modes exist, including pipelines, cable transport, and space transport. Human-powered transport and animal-powered transport are sometimes regarded as their own mode, in general, transportation is used for the movement of people and other things. Each mode of transport has a different technological solution. Each mode has its own infrastructure and operations, each mode has separate subsystems. 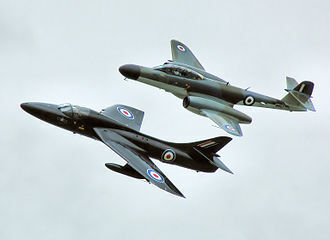 A fixed-wing aircraft, typically airplane, is a flight vehicle. Fixed-wing aircraft ranges from small trainers and recreational aircraft to large airliners, for short distances or in places without runways, helicopters can be practical. Air transport is the second fastest method of transport, after space travel and this celerity comes with higher cost and energy use, and aviations impacts to the environment and particularly the global climate require consideration when comparing modes of transportation. U. S.
airlines alone burned about 16.2 billion gallons of fuel during the months between October 2013 and September 2014. WHO estimates that globally as many as 500,000 people at a time are on planes, land transport covers all land-based transportation systems that provide for the movement of people and services. Land transport plays a role in linking communities to each other. The rails are anchored perpendicular to railroad train consists of one or more connected vehicles that run on the rails, propulsion is commonly provided by a locomotive, that hauls a series of unpowered cars, that can carry passengers or freight. The locomotive can be powered by steam, diesel or by electricity supplied by trackside systems, some or all the cars can be powered, known as a multiple unit. Also, a train can be powered by horses, gravity, railed vehicles move with much less friction than rubber tires on paved roads, making trains more energy efficient, though not as efficient as ships. 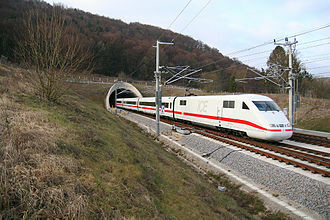 Intercity trains are long-haul services connecting cities, modern high-speed rail is capable of speeds up to 430 km/h, Freight trains traditionally used box cars, requiring manual loading and unloading of the cargo. Physical fitness is a general state of health and well-being and, more specifically, the ability to perform aspects of sports and daily activities. Physical fitness is generally achieved through proper nutrition, moderate-vigorous physical exercise, before the industrial revolution, fitness was defined as the capacity to carry out the day’s activities without undue fatigue. Fitness is defined as the quality or state of being fit, around 1950, perhaps consistent with the Industrial Revolution and the treatise of World War II, the term fitness increased in western vernacular by a factor of ten. Modern definition of fitness describe either a person or machines ability to perform a function or a holistic definition of human adaptability to cope with various situations. This has led to an interrelation of human fitness and attractiveness which has mobilized global fitness and fitness equipment industries, regarding specific function, fitness is attributed to person who possess significant aerobic or anaerobic ability, i. e. strength or endurance. A well rounded fitness program will improve a person in all aspects of fitness, rather than one, a comprehensive fitness program tailored to an individual typically focuses on one or more specific skills, and on age- or health-related needs such as bone health. Many sources cite mental and emotional health as an important part of overall fitness and this is often presented in textbooks as a triangle made up of three points, which represent physical and mental fitness. Physical fitness can prevent or treat many chronic health conditions brought on by unhealthy lifestyle or aging, working out can help some people sleep better and possibly alleviate some mood disorders in certain individuals. Developing research has demonstrated many of the benefits of exercise are mediated through the role of skeletal muscle as an endocrine organ. The Physical Activity Guidelines for Americans was created by the Office of Disease Prevention and this publication suggests that all adults should avoid inactivity to promote good health mentally and physically. Aerobic activity should be performed in episodes of at least 10 minutes, additional health benefits are gained by engaging in physical activity beyond this amount. Specific or task-oriented fitness is an ability to perform in a specific activity with a reasonable efficiency, for example. 1897 Millet motorcycle, showing the common ancestry of motorized bicycles and motorcycles. Note the radial engine built into the back wheel. The front wheel from a racing bicycle. A penny-farthing race at Crystal Palace, London, March 1889. Physical fitness is generally achieved through exercise. Photo shows Rich Froning Jr. – four-time winner of "Fittest Man on Earth" title. Swimmers perform squats prior to entering the pool in a U.S. military base, 2011. Japanese military bike courier pursued by Cossacks (1904). On foot, military couriers are known as runners. The Michaux velocipede had a straight fork and a spoon brake. The modern balance bike borrows from the dandy horse.